Day in and day out, on television, radio and in every paper and magazine I pick up, there is an unending effort to convince me that I am unhealthy and I will die painfully in my prime. Up to now, I have studiously ignored the pressure. But now the midriff is bulging, the stairs seem mountainous, my lungs are wheezing in protest and the scales are groaning to tell me something . After years of the lazy life, when youth takes care of it’s own fitness, I need to listen to their advice. I must exercise. This state of affairs has come about after years of youthful abandon when the only health worries that mattered were the bank balance and it’s ability to afford one the kind of lifestyle that nature never intended, too much good food and mechanical propulsion for the smallest journey. The odd not-so-little drop of the vino completes the picture of decadence. With this in mind (and body) I spent some time checking on the options available to one with needs such as mine, to get fit with the least fuss and bother and minimum effort to mind, body and pocket. Physical jerks seemed a bit strenuous and boring and I was afraid of rupturing something if I “pumped iron” (what a dreadful expression!). Jogging looked cheap, if unbelievably tedious, and you end up where you started, which seems like an awful lot of trouble for nothing. Then until I found out that you need designer track-suit and three hundred Euro trainers . I draw the line at paying that kind of dough for what are fundamentally a pair of sneakers! Finally, having considered all the options, I invested some of my hard earned and of late, scrupulously saved drink money in a shiny new bike . It is the first bike I have had since Santa gave me one, although, sadly, the thrill of newness is a child’s when it comes to bikes . It cost me the same again to rig myself out with what the salesman convinced me was compulsory paraphernalia, consisting of what seemed like tons of special clothes and sophisticated pumps and extra large capacity water bottles and heavy duty locks and, of course, the trusty old puncture repair outfit . Thus kitted, and with thoughts of the Tour De France in mind (I could hear the roar of the crowds already) I began my belated two-wheeled career. On the first day I went for ten minutes. All went well and in no time I felt I could venture a little further than the safe confines of the cul-de-sac outside the house. This was where it all started to go wrong. Cycling is strictly for the brave. I quickly discovered that it is absolutely essential to ride about four feet from the kerb, the gutter being about three feet wide and about a foot deep. Successive attempts to re-tar the road have stopped about a foot from the kerb and the juggernauts have finished the job nicely, turning this area into an obstacle course which would challenge a professional BMX rider. On most roads, this margin means that traffic is a little tight (keep-your-elbows-well-tucked-into-your-sides type tight!). 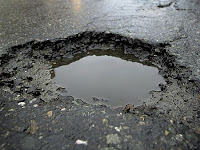 Being a driver of many years I am well used to bad roads and potholes. I know the rules and of course I always drive with courtesy to others, don’t we all! Maybe there’s another perspective. 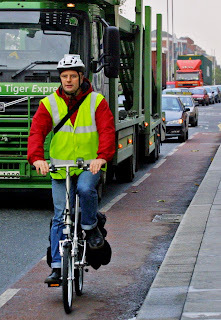 I can see myself on the inside looking out – bloody cyclist! The stereo is blaring, the heater is keeping the wintry weather at bay, the wipers are going full throttle, and you are generally enjoying the comfort of your hard-earned wheels. It’s just too much that these cheeky masochistic maniacs on bikes keep getting in the way and slowing you down. Why don’t they go to a bike park or some other out-of-my-face place. Hells bells, they don’t even pay road tax! When you hop on a bike, the motorist takes on a different mantle. You begin to see these pompous, stupid, arrogant drivers a little differently. What is it about being in a car that allows people to pick their noses or adjust their bras in the middle of a busy street and think no one sees them? The same people turn left at the last minute, ignoring your existence on the inside, neatly forcing you into the pole on the corner, having first carefully chosen the junction to ensure there is a convenient pole or traffic light control box to lessen your chances emerging in one piece. It makes hang-gliding and deep sea diving look like sports for active grandmothers. City cycling is a joy all of it’s own. I have to smile when I see the ad on television that uses the slogan: “Think twice – think bike”. If we could get morons who aim their four wheeled monsters to think at all it would be progress. To the motorist, the cyclist doesn’t exist at all. Whether it is at a junction or the centre lane of the road as the cyclist foolishly attempts to do right turn in the manner proscribed by law, the motorist simply cannot see anything on two wheels. Add to this the indescribable experience of being passed by a bus with misted up windows and you will quickly head for the peace and quiet of the countryside. I have also discovered why bikes are such lightweight affairs: it’s because you need a light bike to save energy to be able to carry the weight of the lock and chain you need to park it, even stopping for a newspaper requires a bit of study. First, you find a solid railing – inches thick and without the offensive sign: “do not chain bikes to this railing” (all the best railings have them). Then you secure the bike, ensuring that both wheels and the frame are firmly wrapped in chain, remove all lights and pocket them together with the pump and saddle bags. Enter shop, looking like you are heading for the Himalayas, buy the newspaper, leave the shop and reverse the process, returning the plethora of accessories to the bike. Then you dismantle thechain, stow it, and you’re on your way. This whole thing will only take about fifteen minutes, after a lot of practice! Then there’s rain. Take my word for it, you haven’t been out in the rain until you have been out on a bike – wet, miserable, cold and dreary. The hours of fun kitting up in the finest of rain wear (it only cost a another couple of hundred) is futile. The makers of the gear have made one silly assumption: that rain comes from above. This is true for all but the cyclist. For him/her, rain comes from below. Mudguards are strictly old world, which means that in the interests of fashionable cycling, you get a continuous spray of water from the front wheel to the chest and face and the rear wheel compliments this with a neat vertical line of mud all the way up your back. To complete the scenario, every car waits for a large puddle before overtaking. Timing is crucial, but most drivers seem to get it just right. Another thing I quickly discovered is that bikes have no shock-absorbers . This means that potholes really are potholes, i.e., things that affect you immediately and very personally (enough said). For sale: Hardly used ten speed racing bike. One careful gutless owner. Will swap for safe, dry, warm exercise bike in working condition – or not!